The public is being told that the CL Financial bailout is being resolved, while at the same time the Minister of Finance & the Economy is withholding the fundamental information which any prudent person would need to make a decision. So, what is the secret? Directors’ Fees – What is the comparative level of Directors’ fees before and after the bailout on 30 January 2009? In particular, what are the fees & expenses payable to CL Financial Directors? Have those increased? If so, to what level and on what rationale? Related Party dealings – We were told that one of the main causes of the CL Financial collapse was excessive related-party transactions. Has that pattern of dealings has really changed? What are the contracts between the group and companies in which Directors hold an interest? Does the group, or the Minister of Finance, keep a record of these connected contracts? Does the group have a robust procurement procedure which would ensure value for money in all its significant transactions? Asset disposals – Which of the group’s assets have been disposed-of since the bailout and on what terms? Were proper valuations obtained before these disposals? There is an interesting nexus between the Integrity in Public Life Act (2000) and the CLF bailout. The Act obliges that public officials make a declaration of their income, assets, liabilities and interests to the Integrity Commission on or before 31 May of each year. There are penalties for non-compliance. We have seen high-profile investigations and prosecutions with the proposed amendments to the Act now being debated in the Senate. CL Financial has already signed over its shareholdings in Republic Bank Ltd. (55%) and Methanol Holdings Trinidad Ltd (56%) to the State under the MoU, and the State has taken complete control of CLICO. Will CLICO, MHTL and Republic Bank Directors be filing returns on or before 31 May? I am seeking an update from you on your progress in relation to this formal report made to the Integrity Commission on 10th September 2012. Apart from a brief telephone conversation we had a few days after its submission, I have had neither acknowledgment or reply to this report. Our recollection in the office is that a response was sent to you and we are examining our records. In any case, a response will be sent to you. I appreciate your early attention to my query. I wrote to you on 20th March 2014 seeking an update to my formal report of 10th September 2012 to the Integrity Commission on this matter. You replied the next day indicating that you thought that a reply had already been sent but that in any case a reply would be sent to me. To date I have had no response to my formal complaint or the request for an update as to its status. In the interim, I have carefully examined the Commission’s 2012 and 2013 Annual Reports and found no mention of my complaint in the sections which provide an outline of the various investigations being undertaken. According to those Reports, the status of those investigations seem to fall into three categories – ‘Closed’ – denoting those matters which have been effectively dismissed, due to lack of evidence or irrelevance; ‘Completed’ – denoting those matters which have been investigated or ‘Continuing’ for those matters which are still under investigation. I am starting to wonder if my formal complaint has been relegated to some new, as yet undisclosed, category. 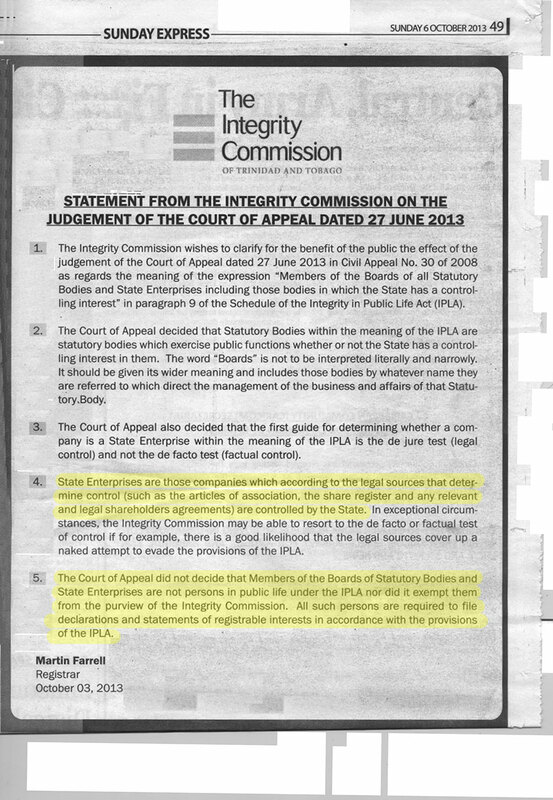 I am also going to point out that, according to the Integrity Commission’s Public Notice at pg 49 of the Sunday Express of 6th October 2013, the Integrity in Public Life Act applies to State Enterprises. At the fourth para of that Public Notice, which was intended to clarify published concerns as to the implications of the Appeal Court ruling in #30 of 2008, you state that State Enterprises are companies which are controlled by the State, so I would again invite your attention to the particulars of my original complaint in this matter. As you would appreciate from my published analysis, the position taken by the Commission in that Public Notice is one with which I strongly disagree, nonetheless, that position is the Integrity Commission’s formal statement on the matter. https://afraraymond.files.wordpress.com/2013/10/ic-response2013.pdf – since I was unable to locate it on the Commission’s website. I am closing by pointing out that this is a matter of the gravest possible public concern, since CL Financial has been the recipient of over $25 Billion TTD in Public Money and its affairs remain shrouded in an intentional obscurity which does violence to the modern notions of Transparency, Accountability and Good Governance. That obscurity includes the channelling of those huge sums of Public Money via the Central Bank which is exempt from the Freedom of Information Act; new laws to approve the exemption of the Central Bank from any judicial review of its actions in this matter (that has now been ruled as unconstitutional by the High Court in #4383 of 2012, of course the State has appealed that, so the fight is on); the failure/refusal of CL Financial to publish audited accounts and the failure/refusal of CL Financial’s Directors to comply with the Integrity in Public Life Act. That is the factual background against which I lodged my formal complaint. The delay and ambiguity with which the Integrity Commission appears to be treating my complaint on this most serious matter is sobering, to say the least. I trust that you can give this matter your early attention, in the meantime, I will be publishing this as a record of these developments. On behalf of Mr. Farrell I do apologize for not responding to your query. Please note that your query was not classified as a compliant so you would not find it in the complaints section of the 2012 or 2013 Annual Report. With respect to your query we have sought and obtained legal advice. However the Commission is not properly constituted ( a Commissioner having resigned and not yet replaced by his Excellency the President) at this time and therefore cannot make decisions. As soon as the Commission becomes properly constituted the matter will be placed before the Commission for a decision. In the interim I would appreciate if you can provide us with a copy of the CL Financial Shareholders Agreement. I thank you for your swift reply and trust that this matter can now receive proper attention. The Ministry of Finance made a Press Release on 12th June 2009 -http://www.afraraymond.files.wordpress.com/2011/03/minoffin_pr_12jun2009.pdf – which I received prior to the actual Shareholders Agreement being released to me pursuant to my Freedom of Information request. As requested, the actual CL Financial Shareholders Agreement of 12th June 2009 is here – https://afraraymond.files.wordpress.com/2010/03/mou21.pdf – for your consideration. Thanks for your understanding. However used the link provided but most of the pages of the Agreement are blank. The Shareholders’ Agreement is showing ok at my end, the scanned copy I was sent seemed a little faded, that was all. The link I sent you yesterday was included in my original email of 10th September 2012, so it’s not clear whether that actually received proper attention. I suppose that the Finance Ministry would provide a copy if you asked, seeing that they sent it to me. The inability of the authorities in Trinidad AND Barbados to fully unravel the CL Financial mess and by extension CLICO in Barbados shines a bright light on an inadequate regional governance system. There is also the insight to be gained by Barbadians from a Trinidad jurisdiction where Transparency Legislation is enacted and operationalized. What have we learned that has forced to improve how pan-Caribbean institutions are regulated. They do not care about us and they will continue to play with words and no action. David Rudder has observed that we have united as a region but that mode is politically unsavoury. What Lies Beneath is a great punishment for our children. Lies beneath lies create unguided lives. Our children have no truth in their lives because each day we spew lies at them. The truth is that lies overwhelm the truth. We believe in God yet we allow the devil to dictate how we profit from our daily peregrinations. People die and no one is guilty. We are grounded in half-truths, blatant lies and outrageous mismanagement yet we are sweetly coaxed to love and unite and trust and support the political-sin-phonies of those entrusted to lead. Stalin projected in 1983, “better days are coming” so we must live like we play we mas and plan for those halcyon tomorrows…when ever they come.